I have always wanted to be more, to know more and to be able to do more than what is expected. The opportunity came when a friend of mine encouraged me to apply for a scholarship to learn coding at a 4-week intensive training bootcamp- SHA( She Hacks Africa) , a scholarship funded by Aspire Coronation Trust (ACT) Foundation and WAAW( Working to Advance STEM Education for African Women) foundation. 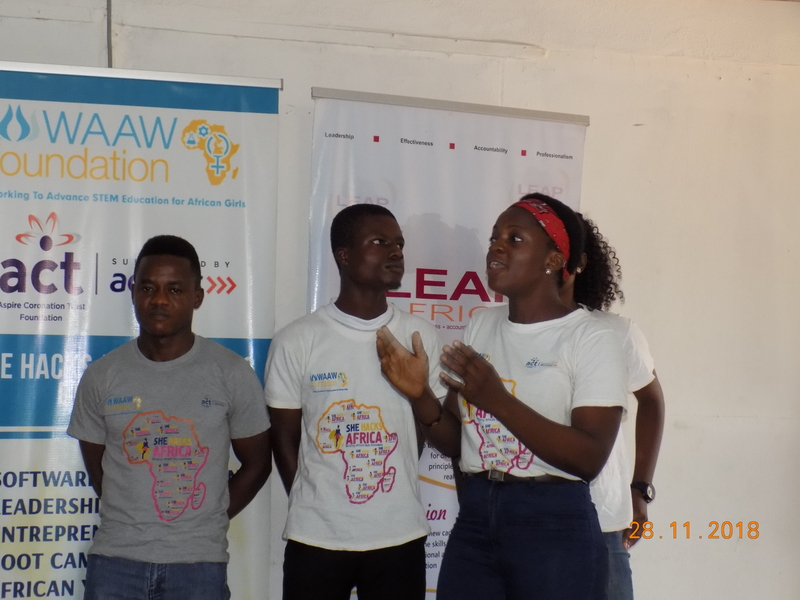 As I learnt beforehand, the program was designed to encourage young African women to consider career paths in STEM ( Science, Technology, Engineering and Mathematics) and also achieve the UN’s Sustainable Development Goals 4, 5 and 8 which are for Quality Education, Gender Equality and Decent Work and Economic Growth respectively. It was exactly what I was looking for. My first day in SHA( She Hacks Africa) cohort 9 did not turn out the way I expected. Since it was STEM, i expected to be bored out of my mind with theoretical illustrations which is the norm but there was a new twist to it. I found a professional combination of fun and learning and also immediate application. We started with an intellectual icebreaker which really broke the ice and made us laugh and at once, I knew I was not going to return the same. One interesting part of SHA initiative is that it does not just focus on coding but it makes sure that we are actually using our skills for good. We were taught Entrepreneurship, Leadership skills, Business management, Design thinking, Business planning and even effective Pitching. These lectures were delivered by seasoned professionals from different establishments like Leap Africa, Aref’s cuisine, WAAW foundation and other private businesses. We were taught how to be Social Entrepreneurs- doing good for our society and also making money in the process. My mind opened to different possibilities and I became so convinced that i could actually effect a change in my world with my skills. SHA( She Hacks Africa) also encouraged teamwork as right from the first week, we were placed in groups. I ended up in group 3 (LAWSPACE) and we were all encouraged to find a problem in our society and proffer a solution to it using technology. After several brainstorming sessions, my group decided to attempt to solve some of the problems we have in the legal sector in Nigeria. We had project presentations every week where we displayed what we had learnt during the week and how we had been able to incorporate it into our own project. 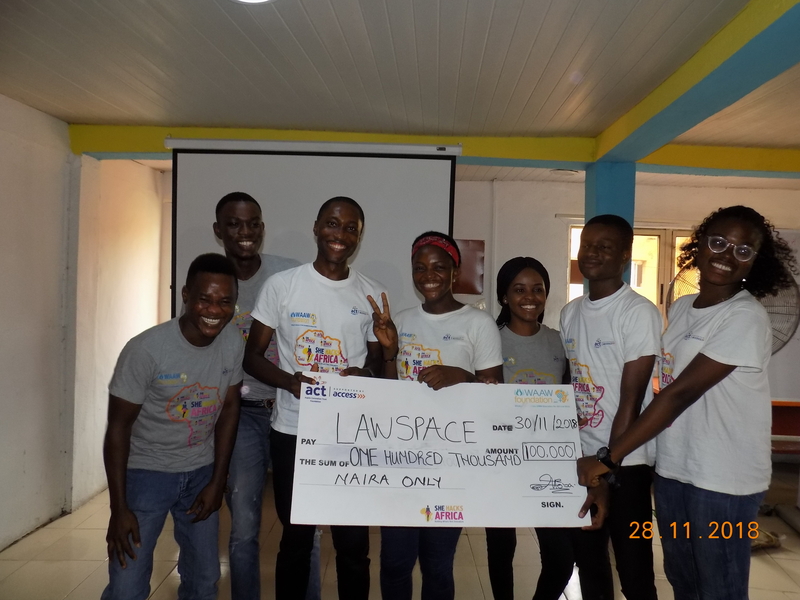 Each group came up with genius ideas but fortunately, LAWSPACE ended up winning all the project presentations! At the end, we were awarded a hundred thousand naira by Access bank for our start-up! The perfect blend of fun and intellectual icebreakers, wonderful lunches, brainstorming, coding, practical thinking, problem solving and innovation is one I would never forget. Like I always say, SHA( She Hacks Africa) is the total package. It was an absolute honour and privilege to have been part of cohort 9. I am ready to change my world!